﻿Anything Goes Moving provides the very best in Professional Moving Services to businesses and residents in Plano, TX. 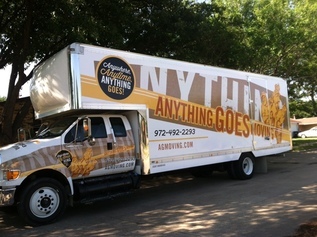 From day one, AGMoving has been a local favorite in Packing / Unpacking services and Moving. No matter the size of your Plano home, we can handle the workload. From one bedroom apartments, to three story 6 bedroom homes, we have the resources and man-power to get the job done right. We work hard to guarantee satisfaction, and will work with your schedule. No need to worry about disassembly or reassembly - our expert team will take care of that for you. Both Plano Business Owners and Plano Residents agree, AGMoving is the Number one local Moving Company to call when you are ready to relocate. As a locally owned and operated business, Anything Goes Moving calls Plano and the surrounding areas home. We are proud to serve Plano and all of Collin County with Professional and Reliable Moving Services. For a free Moving quote in Plano, TX, give Don a call today at 214-232-7478.